To live in the spirit of the Beatitudes, in humility, gentleness and simplicity is counter-cultural to all the messages of today’s society. Our world of consumerism tells us that life can only be complete when we focus purely on our individual needs and comforts. Life becomes about “must-haves”, a display of the labels we wear, the expense of the items we buy, the quantity of our possessions, the latest model, the newest upgrade, the size of our house, the false pride of ownership and the superiority possessions grants us over others. Our Rule guides us away from the possession of possessions and over-valuing the Self by following the example of Our Lord, Jesus Christ – who chose to be born in a stable of poverty yet became Our King. Society tells us to fill our lives with “things” and “stuff” and that we must strive for success always, even to the extent we stop feeling and living in awareness of our self and our self in relationship with our work colleagues, family and others we love. We value liabilities as assets. We strive for personal success at all costs – in ignorance that there is a better way of life. Today commercialism feeds television programmes and internet adverts that makes our greed hungry to own more and more, until possessions possess our souls. We live in a collective arrogance and pride, burdened with stuff, burdened with financial debt, burdened by materialism, burdened with a suffocating planet and burdened with unhealthy stress and anxieties. We force time-scales and deadlines upon our selves to achieve more and more with in less and less time. We rush and hurry through life. We forget to stop, to be still and know God. We forget to slow down. We forget to feel that God’s Holy Spirit dwells within us. We forget to look and be drawn into the wonder of Creation, the splendour of God’s artistry in sunsets, the changing colour of the seasons, the smell of rain on earthy ground and the power in storms and raging seas. And we forget to live our lives to help one another. We ignore those who suffer and devalue the poor. Our society undervalues the humble person and no longer understands humility. In his youth St Francis of Assisi lusted after all the honour and glory of his society. He was born into a wealthy family, enjoyed the latest trends of life and fashions of clothing. He relished prestige and sought fame in becoming a knight. At this time in his life Francis was anything but humble! Following the battle between Assisi and Perugia in 1202 Francis was taken captive and was held in prison for a year. During imprisonment he began to feel the call of God, he heard His voice, his soul started to turn away from worldly worth and to seek spiritual simplicity of the self. His time in goal was the spark to Francis’ conversion. 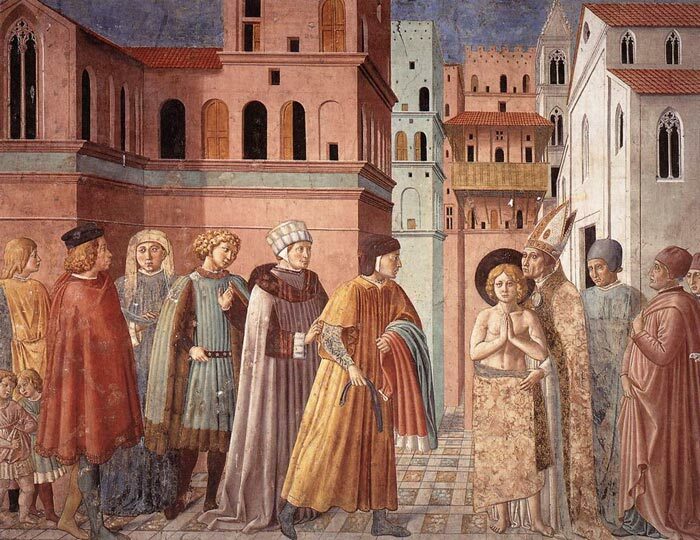 On his return to Assisi Francis after a series of events [involving him using his father’s wealth to rebuild the structure of local churches] he renounced his father, his inheritance and all his worldly goods by stripping naked in front of the local people in the company of the Bishop. Artist : Benozzo Gozzoli – dated 1452 – St Francis renouncing his father. This was a significant moment in the life of Francis. It is not easy to intentionally chose to abandon worldly goods and family ties. Yet this is what Francis did. He turned has life to embrace his brother, Jesus Christ, and to serve God his Father. This was the most dramatic turning point of Francis’ path to sainthood. Francis became a counter-cultural example of living. His message of humility extended not only to lepers, his Franciscan brothers and sisters but to all of God’s Creation. His understanding of faith bought people together in brotherhood and sisterhood, he showed respect and love to everyone whether they be beggar, leper or Pope. He showed Christ to everyone. To Francis kinship was greater than humanity it extended to all of God’s Creation. Francis saw family relationships in Creation. His Canticle of the Creatures shows us Brother Son who is beautiful and radiant, Sister Moon who is precious and beautiful, Sister Water who is humble and precious and chaste, and Brother Fire who is robust and strong. Instead of thinking he was above creatures, animals and elements Francis saw himself as a brother to them. Maybe he took Christ’s example to love our neighbours to an extra lengths, Francis believed that all God’s Created Ones, not just humanity were family members and neighbours to love and share life and joy and happiness in God’s company. St Francis was not perfect – but this makes him our perfect example. He said “I have been all things unholy, if God can work through me he can work through anyone!” How true is that of each of us? Francis is our example of gentleness, simplicity, humility and peace. Our Secular Rule is simple – from Gospel to Life from Life to Gospel. This is what Francis wanted. He wanted to share the Gospel with everyone by preaching and praying and he became the example of life for others to see and hear. This is what we must do – to be the example of God’s love to others. People thought Francis was mad to give his possessions and wealth to the poor and to finance the rebuilding of churches. They thought him crazy to ask his followers to take nothing with them on their journey and his demand that they should take up their cross each day. When Francis gave himself to God’s service he didn’t intend to create an Order or movement of culture. He didn’t imagine anyone would want to follow him. But the people of Medieval Europe were so intrigued at Francis’ joy of living and life despite his abject poverty. The were puzzled at his penance and repentance before God, yet his example of humility, simplicity and gentleness attracted many to follow him. In just 10 years after his time in goal over 5000 men and women became part of the Franciscan movement. In simplicity of self, in gentleness with Creation, and humility before others Francis found his brother Jesus Christ, who lead him to God’s love. A love of truth that embraces us all. We don’t need “stuff” to give us life. Simplicity of life, simplicity of self and being a lesser one, helps us to live honestly and to serve others.